Do you have an old, cracked driveway? Maybe you have a new plain driveway that looks like everyone else’s in your neighborhood? Or was your driveway painted years ago and is now faded and chipping off? Stone Image Concrete Designs can help you repair and update your driveway to reflect your own unique personality. In the past the only options to fixing a driveway was to totally replace which is expensive or use compound to fill cracks which ends up uneven and visibly patchy. Decorative Concrete resurfacing is now the option homeowners are finding to be the most affordable and practical. There are many options in colors, textures, and designs possible for you to choose from. 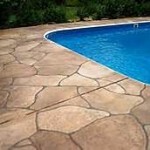 There are spray textures or trowel methods of concrete that are used. Beautiful and tough, the Sprayed texture or “Orange Peel” can give your home a look that’s as distinctive as your imagination and personality. This application provides a slip free surface, perfect for pool decks, commercial entrances, driveways, walkways, patios and more. Much cooler under your feet than bare concrete. The colors can match your home or resemble any type of stone you would like. The designs are endless. 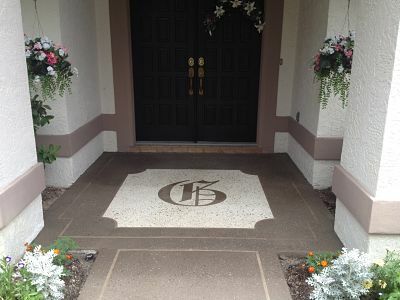 Medallions, last initials, or scroll work can be applied to the driveway to give your home its own unique style. Stone Image Concrete designs does not stop just at driveways. If you would like your porch, lanai, or pool deck to match your driveway it can be done. Installation is fast!